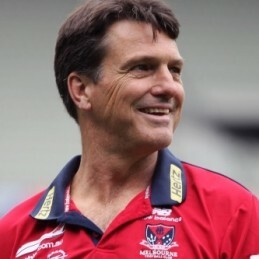 Paul Roos is one of the most revered and successful coaches of the modern Australian Football League. Roos’ reputation as a player and a coach is almost unparalleled. His presentations give insights into the sport, how clubs operate as a business, and the creation of a winning culture. Roos is a highly successful corporate speaker, columnist, author and television host. Paul Roos’ moment of glory was hoisting the premiership cup on grand final day 2005, ending the Sydney Swans 72-year premiership drought. Following the win he would be named the 2005 Australian Sports Coach of the Year. Many commentators and writers attributed the Swans historic win to the ‘Roos factor’. Former Hawthorn great Peter Schwab said “The greatest strength in Roos’ coaching appears to be his ability to make a group of players believe that everything is about and for the team”. A year later the Swans would come up against the same opponent but fall in a 1-point margin. Roos would take defeat like a true sportsman and champion. Following his playing career, Roos became an assistant coach with the Swans before filling the vacant caretaker coaching roach mid-way through the 2002 season. In 2003 Roos signed a three-year deal and would have immediate success taking the team to the finals and being named AFL Coach of the Year in his inaugural year at the helm. During his 356-game playing career, Roos was known as a highly mobile player with reliable marking and kicking skills. He began his a distinguished career with Fitzroy, serving six seasons as captain, before moving north to play 87 games for Sydney. Roos would represent Victoria in state of origin competition 10 years in a row, including two as captain, winning the EJ Whitten Medal for best Victorian player in 1985 and 1988. He was selected in the All-Australian team seven times, twice as captain, and following his retirement inducted in the AFL Hall of Fame. Stepping aside as Swans coach and leaving the club in a great position, Roos took a role of coach of the Swans Academy. He would balance this with time in media as a columnist with News Limited newspapers and member of Fox Sports AFL commentary team, appearing on popular panel show On the Couch with Mike Sheahan and Gerard Healy. At the end of the 2013 season, Roos was appointed as the coach of the Melbourne Demons. Roos took the reins of a struggling team with the plan to make the team competitive and groom a successor.